Looking for something beautiful and unique? Then come along to the next Boutique Markets in Balmain! The markets showcase high quality handmade and limited edition goods by some of the best local talent in art craft and design, so you will be sure to pick up something exquisite. The stallholders at Boutique Markets may be crafters, artists, dressmakers and even Mums and Dads. 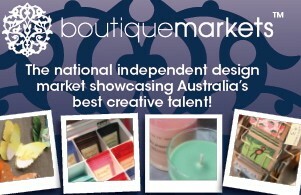 So join us at the Boutique Markets to meet these friendly and very talented designers and enjoy a great day of shopping!